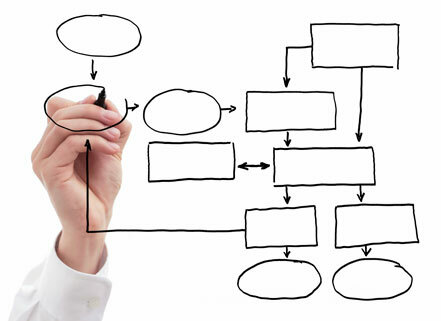 Business processes are a fundamental building block of organizational success. Even though effectively managing business process is a key activity for business prosperity there remain considerable gaps in understanding how to drive efficiency through a process approach. Building a clear and deep understanding of the range process, how they function, and how to manage them is the major challenge facing modern business. The right business process management software and services empower organizations of all sizes to not only meet but exceed their customers’ expectations, not only react to, but anticipate shifts in their marketplace, and all of this while keeping costs under control. The goal of BPM is to reduce human error and miscommunication and focus stakeholders on the requirements of their roles. There is a big variety of BPM software at present, but there aren’t so many really good solutions. Today we’ll examine one of the greatest BPM platforms – Activiti. It is a light-weight workflow and Business Process Management (BPM) Platform targeted at business people, developers and system admins. Activiti supports all aspects of Business Process Management (BPM) in the full context of software development. This includes non technical aspects like analysis, modeling and optimizing business processes as well as technical aspects of creating software support for business processes. Activiti Explorer is a part of the Activiti platform. It’s a web application, which includes task management, viewing reports based on statistical history data and process instance inspection. In case of the task management you can view task lists, create new tasks, complete and reassign to a different user, see which other people are involved in the process related to this task and create subtasks and assign them to people. Manager can view task list of subordinates and process owner inspects process instance details related to a task. All events related to process instance executions are stored in a process history database. Since the steps/activities in the original process definitions are meaningful to business people, the statistics on these activities can contain very interesting information for business people. For example, the average time spend in each activity or the average deal size per country. 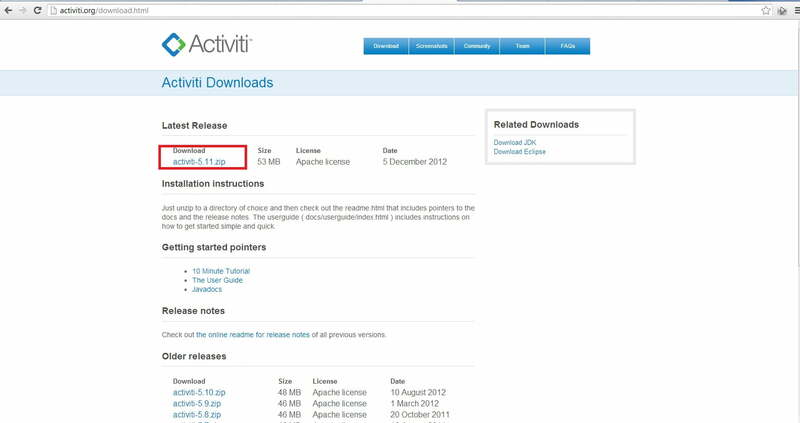 Here’s also a short instruction on how to get Activiti Explorer up and running in the cloud just in a few minutes. 3. 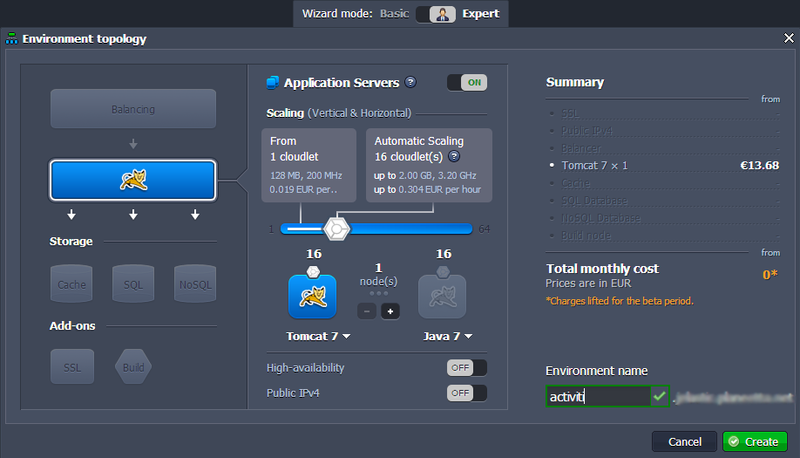 In the opened Environment topology dialog, pick Tomcat 7 as your application server, specify the resource limits (e.g. 16 cloudlets), type your environment name, for example, activiti and click Create. In a minute the environment with Tomcat 7 will be created. 1. Navigate to Activiti web site, click and download the latest version of Activiti Modeler as a war package. 3. Upload your Java package (activiti-5.11/wars/activiti-explorer.war) to the Deployment manager. 4. Open your application in a web browser. 5. Log in with the default credentials kermit/kermit. Now you can start using it for task management,viewing reports and process instance inspection. It’s really easy and fast way to mange your projects with a robust, familiar, and flexible project management tool. Please let us know what project-management applications helps your business in the comments below. Stay tuned to our blog for even more exciting stuff!